It's always my tradition here in this blog to count the blessings and look back to the lessons of the past as the new year started. 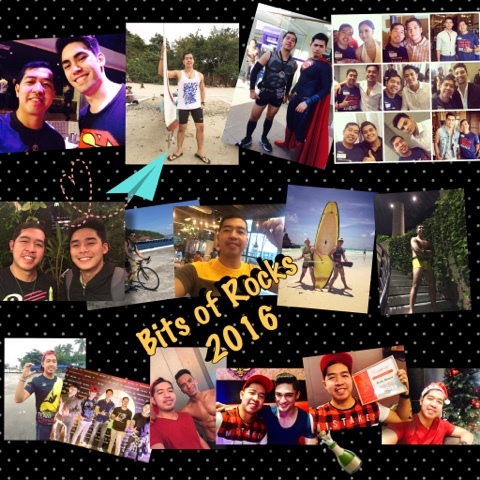 Though I already enumerated my Top 10 achievements of 2016 in my fitness blog Runner Rocky, I will still count here the highlights of my 2016. Blogging and social media success specially to my blog Runner Rocky. Celebrated 3 years in my new company. Received my 3-year loyalty award, a plague of appreciation. Bought our own lot for our future dream house! Received awards - in work (3 years loyalty awards, ERComm's fit buff), in blogging (GMA Blogging Awards, BlogEX Best Sports, Health and Fitness Blog for Runner Rocky). First time to ride in airplane during our Boracay travel last August. Travel to different places in the country namely Boracay, Puerto Gallera, Tayak, Corregidor, and Cagbalete. Travel stories and travel videos were already uploaded in my YouTube channel via www.youtube.com/RunnerRocky. Finally had a selfie with Mario Maurer when he went back to Manila. Met new stars and celebrities for the very first time like Pio Luz, Elisse Joson, Clint Bondad, Marlon Stockinger, and McCoy De Leon to name few. Got a sponsored international marathon via the Danang International Marathon in Vietnam but I didn't pursue due to conflict in work schedule. Had a lovelife like the teleseryes "Tubig at Langis," "Imortal," "Pangako Sa'yo," and "FPJ's Ang Pribinsyano." Experienced a real-life lovelife conflict like the Angel Locsin-Luis Manzano-Jessy Mendiola triangle! A year of alliance and sanib pwersa! My very own sports, running, blogging, and online team called Team Runner Rocky was officially launched with 10 members initially. Left my former running team Team Run Direction (TRD) which I've stayed for more than 1 1/2 years. Joined a new running team which is the Team Cholo Flight (TCF). New logo for Runner Rocky, a double R which means "Strength and Speed" was launched. The said blogsite is more empowered with its fresh new look, with its own YouTube account, and a likers and followers of more than 12K. Media partnerships for more and more events specially in running and marathons. Covering major fitness competition events namely the Century Tuna Superbods 2016, the Slimmers World Great Bodies 2016, and the Gold's Gym BodyCon 2016. Had conquered a booming 43 runs which include 4 major full marathons, an obstacle race, an relay ultramarathons. Revealed a sexier version of me, half-naked which trended in social media! Well, those were some of the highlights of my 2016. I listed them in a summarized form. Remind me if I forgot to include some important details.